All Custom Framing at Wholesale Always 40-50% Off, located in Vancouver, Washington and near Portland, Oregon is open to the public. No project is too big or too small. We have over 2,000 frames and mats to choose from and can complete your custom picture framing order from start to finish. If you do your own picture framing, let us provide the picture framing supplies and materials you need. Either way, you won’t believe our prices. We guarantee superior craftsmanship at deeply discounted rates which are always 40–50% off retail prices typically found in major chain frame stores. When choosing a frame shop it is wise to consider not only what techniques and materials will be used but also, who will be handling your artwork. Experience and skill level is what truly defines each frame shop and ultimately determines your satisfaction with the finished product. It is for this reason we promote our 21 years in business and combined experience of 145 years. Over these years we have framed a wide range of projects involving a vast array of mediums and styles. The technical and creative knowledge we have accumulated, of both art and framing, is invaluable. It is the greatest and most interesting asset of our business. 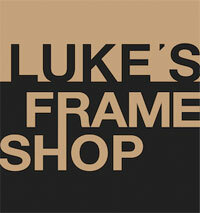 At Luke’s Frame Shop, we believe that custom framing should be relaxed, comfortable, affordable, and professional. We aim to gain your trust and confidence through excellent customer service, a unique design sensibility, and expert knowledge and experience in preserving and presenting all kinds of artwork. We offer high quality framing, artwork, and materials at fair prices, maintain a quick turnaround time, and can work within your budget to find just the right solution. Every customer gets the lowest price all the time, with single or multiple projects. We believe that when frame shops offer year round discounts and sales they are overcharging their customers. We give you the lowest price everyday without a coupon or the need to negotiate.